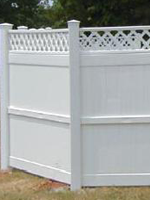 PVC or poly vinyl chloride is much more than just a plastic fence. Available in many heights, styles, colors, and textures, you have probably seen many PVC fences that look like a painted wood fence. While typically more expensive than a comparable wood fence, PVC is maintenance free, and unlike wood fences require no painting or replacing of rotted or warped fence components down the road.